Since I’ve started eating primal, my egg consumption has gone way up. On days when I actually possess a little motivation before 9am, I might fry some with a few vegetables or some apple for breakfast. More often I eat hard boiled eggs as snacks. In my opinion, hard boiled eggs are nature’s perfect convenience food. Already in their own little wrappers, you can take them in the car, on a picnic, or to the office for a 3pm snack. As much as I love these little guys, they can begin to seem a little bland after a while. I’ve noticed that it takes a week for a dozen hard boiled eggs to disappear from the fridge, but the same number of deviled eggs is gone in just a few days. A few days ago I experimented with some new deviled egg recipes. First I worked on perfecting the proportion of ingredients for my standard deviled egg recipe. I also substituted apple cider vinegar for the white vinegar I used to use. Then I worked on creating other recipes that incorporate complimentary flavors from different cuisines. If you like to play around with different flavors, this is a fun, low-risk project that allows you to see how different herbs, spices and other ingredients work together. The egg provides a neutral medium for the other flavors and you can use what you learn to create more complex dishes like soups, stews, salads, etc. If something goes horribly wrong, its not like you’ve ruined your whole dinner. Just grab some fresh eggs and start again! Here are the 4 recipes I ended up liking best. They are all very distinct and look beautiful when combined on a platter. I can’t say which is my favorite because they are all good in their own ways. Dave likes the Indian ones the best. The kids seemed to prefer the traditional. I went a little crazy tricking them out with garnishes and such but just so you know, if nobody is going to see them but my immediately family I dont invest much time in making them pretty. You can get the messy hair look by using a fork on the yolk mixture and then carefully transferring it with a spoon so that the textured part remains on top. You can also use a pastry bag and star tip for a more refined-looking egg. Pushing the yolk mixture through a plastic bag with the corner cut out works pretty well, too. Heres how I make perfect hard-boiled eggs. If you cook them too long, the yolks get an unappealing gray-ish ring around their exterior. Cook not long enough and the yolks will be too soft. Place 6 eggs in a pot, cover with water, and bring to a boil. After the water reaches a slow boil, set the timer for 10 minutes. At the 10 minute mark, bring the pot to the sink and dump out most of the water, replacing the water with cold tap water. Continue to dump and fill until the water in the pot is cool. Let eggs sit in the water until cooled. I like my eggs on the less-creamy side. If you like yours more creamy, just add in more mayonnaise or yogurt. Note: I really like the butter in these as an alternative to mayonnaise, but if you are not going to serve them right away, substitute another tablespoon of mayonnaise because the butter will harden the yolk mixture in the fridge. Peel the eggs and cut in half lengthwise. Transfer the yolks to a small bowl and use a fork to break the yolks into small pieces. Add the other ingredients and mix well with fork. Using a spoon or pastry bag, transfer the yolk mixture back to the egg whites. Garnish and serve. You have a great blog here. I enjoyed your recipe on MDA, and followed it here. Great to find another blogger who is passionate about the same things. Did you make this site yourself? It’s beautifully designed and formatted. Thanks, Bryce. Glad you found my blog. My husband is a web designer and very handy with WordPress – lucky me! Hi! I just added your blog on my google reader. 🙂 Nice post, too. I have noticed that my egg consumption went up as well. My husband worries about it sometimes, on those days when I have eggs for breakfast AND lunch. But I love it! What about tips for peeling those suckers? I’ve tried the “blow it off” method with absolutely no luck. Lately I seem to peel half the egg off with the shell! It’s so frustrating. I have always had a great love for deviled eggs, making a world tour of them is such a brilliant idea. I think I’ll have to make my own world tour soon. i love deviled eggs and your tour is amazing! just a great twist on a classic. Love your blog! I think I love you!!! I don’t know why I haven’t stumbled across your blog before but what amazing recipes you have! 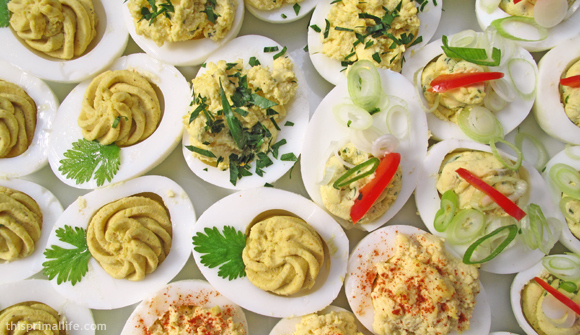 I have a serious love on for deviled eggs and I NEVER thought to make them as a change up.